In the smartphone category, Amazon is offering some good deals in the form of exchange and cashbacks. Some smartphones are also listed on the Amazon Freedom Sale with outright discounts and price cuts. Amazon has kicked off its Freedom Sale in India to mark the upcoming Independence Day of the country. The Amazon Freedom Sale will last till August 12, during which period users can expect over 20,000 deals on smartphones, major appliances, electronics and more. Last month, Amazon hosted a Prime day sale which was exclusively open to Prime members. However, the Freedom sale is open for everyone. The sale will see the launch of many new products, along with cashback offers and discounts. In the smartphone category, Amazon is offering some good deals in the form of exchange and cashbacks. Some smartphones are also listed on the Amazon Freedom Sale with outright discounts and price cuts. Let’s take a look at some of the best smartphone deals available in the sale as of now. The Honor 7C features 3GB RAM, 32GB internal memory expandable up to 256GB (dedicated slot); dual SIM (nano+nano) and dual-standby (4G+4G). It has a 13MP + 2MP primary dual camera setup and 8MP front facing camera with F2.0 aperture with soft selfie toning light. The phone comes with a 5.99-inch Honor FullView (18:9) Display, LED capacitive touchscreen with 720 x 1440 pixels resolution. It has Android EMUI v8.0 on top of Oreo operating system with 1.8GHz Qualcomm Snapdragon 450 octa core processor. The phone supports both face and fingerprint unlock and has a 3000mAh lithium-polymer battery. There is 1 year warranty on the handset and 6 months on battery /charger, 3 months on accessories(data cable) provided by the manufacturer from date of purchase.Click here to buy. The Vivo V9 features a Qualcomm Snapdragon 626 octa core processor, 4GB RAM, 64GB internal memory expandable up to 256GB and dual SIM (nano+nano) dual-standby (4G+4G). It has 16MP+5MP dual primary cameras with ai face beauty, time-lapse photography, live photo, bokeh mode, AR sticker, shot refocus, ultra HD, professional mode, smart motion, palm capture, gender detection, professional, PPT, panorama, 4K video, camera filter, face beauty video, HDR and 24MP front facing camera. The display of the phone is a 6.3-inch full HD+ capacitive touchscreen with a 2280 x 1080 pixels resolution. There’s a 3260mAH lithium-ion battery onboard. On the purchase of the device, buyers also get 1 year manufacturer warranty for device and 6 months manufacturer warranty for in-box accessories including batteries from the date of purchase.Click here to buy. The Honor 7X features 4GB RAM and comes in 32GB of storage. The phonw sports a 5.93-inch LCD display with a resolution of 2160 x 1080 pixels and a taller aspect ratio of 18:9. The device is powered by the company’s own Kirin 659 chipset and supports expandable storage of up to 256GBvia a microSD card slot. The Honor 7X features a 16MP+2MP dual rear camera setup and comes with an 8MP front-facing camera. The handset runs EMUI 5.1 on top of Android 7.0 Nougat and sports a rear-mounted fingerprint sensor. It is powered by a 3340 mAh battery and uses micro USB port for charging.Click here to buy. 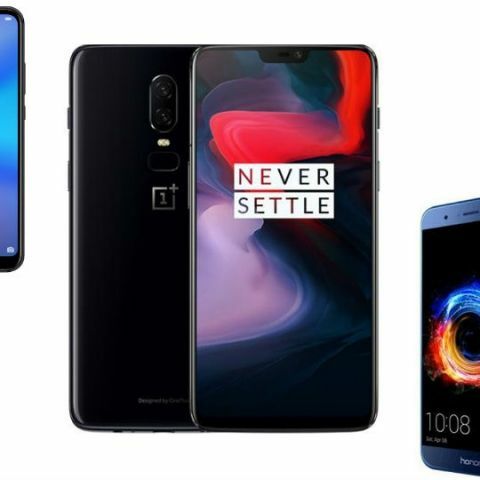 While the price of the OnePlus 6 flagship smartphone has not dropped in the sale, there a bunch of lucrative deals available to woo customers into buying the smartphone. The OnePlus 6 is currently one of the best flagship devices available in the country. It features a 6.28-inch FHD+ Full Optic AMOLED 19:9 display with 2280 x 1080 pixels resolution. A 2.5D Corning Gorilla Glass 5 protects the screen. The phone gets a 20MP+16MP primary dual camera setup with OIS, Super Slow motion, Portrait mode and a 16MP front facing camera. It runs OxygenOS based on Android Oreo 8.1 coupled with a Qualcomm Snapdragon 845 octa core processor, 6GB RAM, 64 GB internal memory and dual nano SIM dual-standby (4G+4G). A 3300mAH lithium Polymer battery with Dash Charge technology powers the device. Other features include - Face Unlock, Fingerprint scanner, Water Resistant, Glass back and NFC.Click here to buy. Reliance Jio offer: Enjoy upto Rs 2,000 cashback with Rs 299 unlimited Jio plan. The Huawei P20 Lite features a unibody design and features a 5.84-inch full-HD+ screen with a 19:9 display aspect ratio. The smartphone is powered by the Kirin 659 SoC and comes with 4GB RAM and 64GB of internal storage, which can be further expanded using a microSD card. It comes with a rear-mounted fingerprint sensor and runs on MIUI 8.0, which is based on Android 8.0 Oreo. In the camera department, it features 16MP + 2MP dual-rear sensors and on the front, it’s equipped with a 24MP sensor with f/2.0 aperture lens. The device supports face recognition and is powered by a 3000mAh battery.Click here to buy. LG’s previous gen flagship smartphone offers a large 6-inch QHD+ OLED display with an aspect ratio of 18:9. It is powered by a Snapdragon 835 SoC and Hi-Fi Quad DAC for improved audio, At the back is a 16MP + 13MP dual-rear camera setup. While Samsung is expected to launch the new Galaxy Note 9 anytime now, the old Galaxy Note 8 is still a pretty powerful piece of tech. Further, those planning to exchange their old phone will get an additional Rs 8,000 off on the exchange value of their device. Those buying goodies from the Amazon Freedom Sale should note that there is a flat 10 percent discount for SBI debit and credit cards. The maximum discount one can get is up to Rs 1,500, with a minimum order of Rs 3,000.